Outdoor kitchens enhance the beauty and elegance of your home’s backyard, terrace, deck or plot. It provides a casual entertainment experience that will elevate you to a new world of enthusiasm and exhilaration. The popularity of outdoor kitchens and outdoor living has skyrocketed in Oklahoma in the past few years. Getting firsthand information from Green Acre Sod Farm about outdoor kitchens is essential before building an outdoor kitchen for your Oklahoma outdoor living space. Your property’s available entertainment space and food preparation space outdoors is particularly important. The total number of people that you plan to entertain is a major factor that determines the type of outdoor kitchen that is needed. • Maximize the space you have to work with. • Help you decide the position of your outdoor kitchen. • Familiarizing you with accessible trends and outdoor kitchen products. • Draw up a plan for an outdoor kitchen that includes your specific interests, tastes, and budget. With an outdoor kitchen, you change the outdoor cookout experience and bring it to another level of enjoyment for you and your guests. By involving yourself in the design and production of your outdoor kitchen, you can make your outdoor barbecue more beautiful, original and practical. 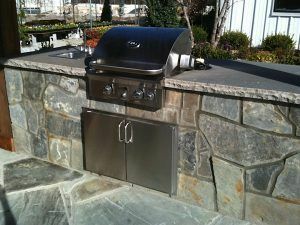 Instead of using a rusty barbecue pit that is from Father’s Day three years ago, you can enjoy the comforts of your kitchen right in your backyard with the perfect appliances surrounded and built up by natural building stones or interlocking paver stones. Comfortable places to sit and visit such as sofas, chairs, and other outdoor furniture, will add the finishing touch to your outdoor living space. We offer pick-up, delivery and professional installation. Products and delivery availability may vary by location.